The Leonberger is one of the newer breeds admitted to the American Kennel Club, but has been bred overseas since at least the mid-1800s. This loveable, very large breed makes a wonderful family companion, provided you can provide for their needs and keep up with all that beautiful fur! Leonbergers are roughly 30 inches tall. 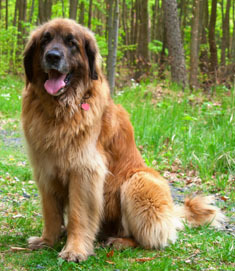 Female Leonbergers average around 115 pounds, and males can tip the scale at about 150 pounds. Leonbergers range in color from lion-yellow to red to red-brown or even sand. They may have black tips highlighting the fur. Lionberger has a soft dense undercoat covered by a long outer coat. Leonbergers have a wonderful personality and are never aggressive or shy. Primarily used as a companion dog, this dog will do whatever you train him or her to do, but mostly just wants to play with you and your kids. Leonbergers generally get along well with other family pets. Leonbergers have an unusually low incidence of the hip problems that plague other giant breeds. Like other large breeds, they can suffer from bloat. The most common cause of death is cancer, followed by problems affecting the heart. Leonbergers have an average life expectancy of 7 years. Despite their size, Leonbergers don’t necessarily need a lot of space. Give them a little bit of yard to do their business, take them for frequent walks to keep them busy, and if possible give them access to a body of water, and you will have one happy Leonberger! Leonberger belongs to the Working Group. The Leonberger is one of the newer breeds admitted to the American Kennel Club, but has been bred overseas since at least the mid-1800s. This lovable, very large breed makes a wonderful family companion, provided you can provide for their needs and keep up with all that beautiful fur! This lovable, very large breed makes a wonderful family companion. What does a Leonberger look like? This is one very large dog! Fully grown, they stand about 30 inches tall at the shoulder and weigh in excess of 100 pounds. Females average around 115 pounds, and males can tip the scale at about 150 pounds. They are well-muscled and can range in color from lion-yellow to red to red-brown or even sand. They may have black tips highlighting the fur. One of the most distinguishing features of the Leonberger, regardless of body color, is the black face mask extending above the eyes. The nose and lips should always be black, and the eyes are a rich, deep brown. The soft dense undercoat is covered by a long outer coat that lies flat against the dog. Both layers are necessary to protect the dog both from getting too cold and from getting too hot. Shaving this dog is not recommended, no matter how much you hate dealing with all of that fur. And deal with it you will. Weekly brushing is required to protect the fur from matting and to work out all of the dirt the dog has played in since the last time you brushed. Just for added fun, the dog blows his undercoat seasonally, at which time brushing twice a day is not even enough to prevent him from shedding all over your house. 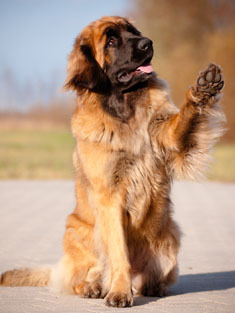 A unique feature of the Leonberger is that the male dog looks distinctly different from the female. Males have a distinct mane surrounding the face, while females have a more elegant look. Weekly brushing is required to protect the fur from matting and to work out all of the dirt the dog has played in since the last time you brushed. A dog looking very similar to the Leonberger was described in the late 16th century, belonging to the royal household of Austrian Prince Franz Metternich. However, these dogs were never formally registered with a kennel club, and little is known of their pedigree. Therefore, the breed’s origination is generally credited to Heinrich Essig, who hailed from the town of Leonberg (near Stuttgart) in Germany. The dog is said to resemble the lion on the town’s crest. Essig’s key strength lay in marketing and promoting the dogs, not necessarily in keeping detailed breeding records, so there is some suspicion as to the real predecessors to the Leonberger. Essig says he interbred a Newfoundland, a Saint Bernard, and a Pyrenean Mountain Dog, but most canine historians agree it is likely that several non-pedigreed local dogs are represented somewhere in the mix. It took about 15 year, but the first Leonbergers to be registered were born in 1846. Essig used his marketing abilities to help boost the dog’s popularity through placement with several royal households throughout Europe. Leonberger’s were also used as models for many artists, further catching the attention of would-be dog owners. During World War I, Leonbergers were used to pull ammunition carts, resulting in their near extinction. It is said that just 25 Leonbergers could be found after the war, with only five of them suitable for breeding. The breed was built back up, only to have the Great Depression and World War II nearly wipe it out again, leaving just 8 dogs surviving. Dedicated breeders were able to revive the breed in Europe, and the popularity of the Leonberger started to rise in the United States during the late 1970’s. The American Kennel Club recognized the breed as part of the Working Group in 2010. 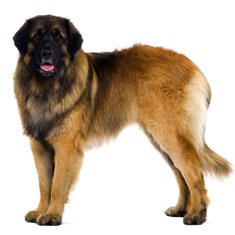 What is the Leonberger suitable for? One of the most distinguishing features of the Leonberger, regardless of body color, is the black face mask extending above the eyes. Although large and strong, the Leonberger is primarily used as a companion dog. They absolutely love the water can be used for water rescue. This dog will do whatever you train him or her to do, but mostly just wants to play with you and your kids. Leonbergers generally get along well with other family pets. Leonbergers have a wonderful personality and are never aggressive or shy. They are, however, a handful. Left to their own devices, they become bored and will bark, dig, and / or destroy your stuff in an effort to get your attention. They’re not malicious, they just want companionship. Training can definitely be an issue with this breed. Leonbergers are, above all, very large. If you do not take the time to train and socialize them at an early age, you will suffer the consequences later. Picture the guy “walking” Marmaduke, but really sailing down the street behind him, and you can imagine just how life would be with an untrained Leonberger. Because of their love of water, Leonbergers are most often slightly damp and muddy. It simply doesn’t bother them, although it may be a big issue for you if they take over your couch or bed with dirty feet. Although the dogs are big, they don’t necessarily need a lot of space. Give them a little bit of yard to do their business, take them for frequent walks to keep them busy, and if possible give them access to a body of water, and you will have one happy Leonberger! Are there any particular health issues for Leonbergers? 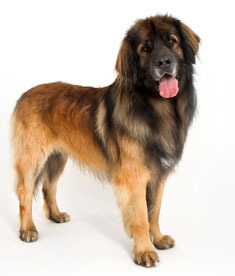 Due to the dedication of careful breeders, Leonbergers have an unusually low incidence of the hip problems that plague other giant breeds.Breeders belonging to the Leonberger Club of America committed a long time ago to breed only those dogs who were certified free of dysplasia for at least three generations back. Now that registration is done through the AKC rather than the breed club, there is no longer such a strict requirement, but some breeders continue to follow this strict standard. Only about 10 – 15% of Leonbergers now suffer from hip dysplasia. The Leonberger Health Foundation was set up to support research aimed at finding genetic markers for life-threatening diseases which can affect these dogs. Their current focus is on osteosarcoma, hemangiosarcoma and Leonberger Polyneuropathy. The first two are cancers of the bone and blood, respectively. The last is a disease of the nerves. 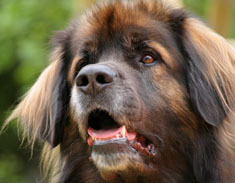 You can find out more from the Leonberger Health Foundation. The average Leonberger lives just 7 years, which is much shorter than most purebreds, but similar to the lifespan of other giant breeds. The most common cause of death is cancer, followed by problems affecting the heart. One other health issue you should be aware of in this breed is bloat, formally known as Gastric Dilatation Volvulus. Any large breed dog can suffer a twist of the stomach after eating. This is a veterinary emergency as it can quickly be fatal if untreated. Is the Leonberger the right breed for my family? German-born Geeske Joel, who has bred Leonbergers for years, has a great article on her website about the facts and drawbacks involved in living with a dog this big. If you are considering buying one of these gentle giants, make sure you read the whole article, all the way to the end. Find Leonberger Puppies with our Free Breeder search!